Self-Publishing, Building the business website, lessons from KickStarter, and more great art! I am a fan of the print on demand business model. It allows folks, like me, who really don't have money or space for merchandise to control costs in an easily facilitated way. 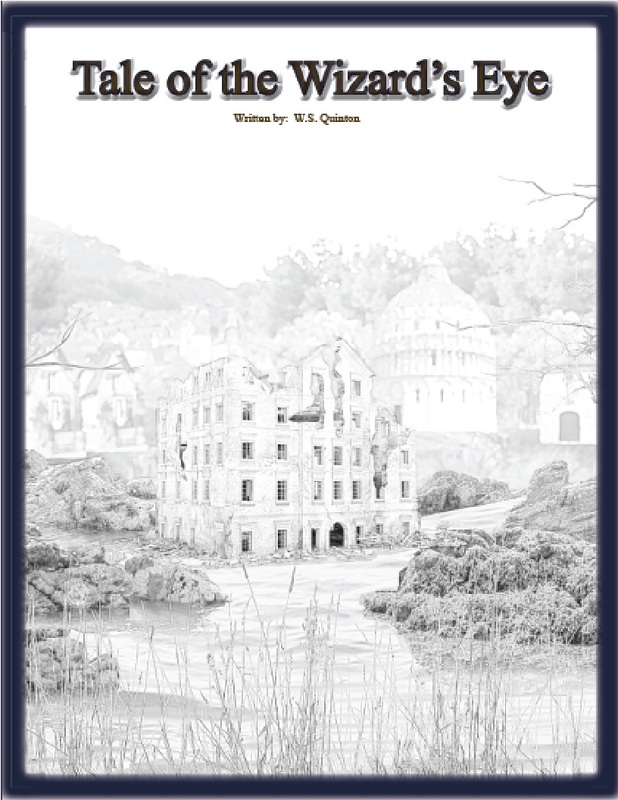 The folks over at Drivethrurpg.com have been a great asset to the small writer/self-publisher. With my first book funded, and backer rewards going out soon, I'm looking at other ways to place my products in front of people. A web site for my company is my first step. Web site development: this is not my field of expertise. So I'm working on building a website, with help from some very talented friends, to facilitate certain business needs. Now that is a bit vague, so bear with me as I outline my approach, and please do keep in mind that I am the new publisher (still) so what I have in mind is what makes sense to me. You may have better ideas on how to approach things, and if so please comment to that below. My first concern/need for the web site is for commercial functions. I want the site to be able to facilitate the sale of digital copies of my books. This cuts out the middle man so I have a slightly higher profit margin on sales. To facilitate this, I'm working on a user account set up that will allow the user's who purchase digital copies to download that product, but also to flag that user's account to acknowledge that the user has purchased it as well. This would allow customers who have lost their file to download it again without the need for additional purchase. To make this work, I will need to finish building out the user account system. Building on the first issue, the user accounts should have certain functionality outside of just buying product. Access to newsletters (opt in or out as the user desires), access to comment on product pages, and access to a forum (which I'll need to build as well). The user account becomes important with regard to access security, so security features will have to be implemented as well. Does this seem complicated yet? It does to me as well, but fear not, I'm learning. My second concern/need for the website is that is facilitate communication with the consumer. This functionality has to be available at various levels. Firstly, I want users to be able send in questions and concerns outside of the forum for those issues they may want to address less publicly. Secondly, I would want account holders to be able to communicate to particular people. This second point goes back to my promotion of those artists who work for/with/alongside me. This would help account holders who want to commission art to do so, and benefit those artists directly. While this isn't a monetary point for me, it is an important part of my business model and I want it working smoothly. This reinforces the need for solid security for the user accounts, as I don't want people spamming the artists with "How to win the Lottery" trash emails. My third concern/need for the website is to enhance is visibility. That's right ladies and gentlemen, the whole search engine optimization issue everyone prioritizes. Enhancing your online visibility is important, and so this is an issue I'll be going over thoroughly. What is the point of having a sharp and user friendly web site if no one can find it? Number one: You are going to get a lot of email from people who want to "help" you reach your funding goal by charging you a fee. I have not entertained using such services and frankly I don't think I ever will. From my personal standpoint, I would rather ask people to refer others and spread in an organic fashion than have people who have captured email addresses charge me to use them. I don't doubt the efficiency of such a model, I just don't like idea of paying people who essentially farm the use of other people's email addresses. You may not agree with me, and that is fine. What I will do is ask other people to refer folks to me. 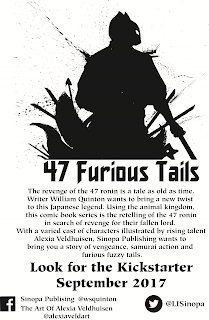 Example, for 47 Furious Tails I've asked a number of friends and family members to take fliers into comic shops to ask that those fliers be placed on their community bulletin boards, and to invite the chops themselves to back the project. I also ask people to share information on projects on their social media platforms. 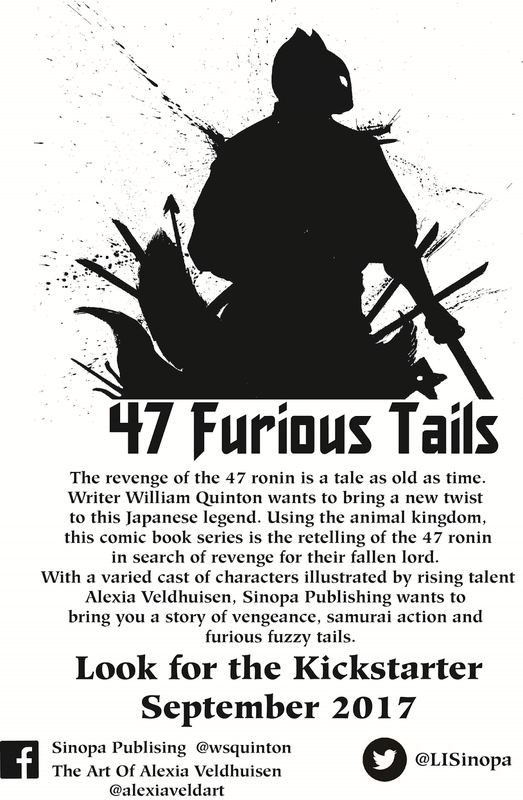 I've also asked people who have had recent successful comic book KickStarter campaigns to give 47 Furious Tails a mention in an update on their projects. The difference, to my mind, is that backers aren't being treated as a commodity. That respect for the backers is an important point to me and I ask that you would consider how you would like to be regarded if you back a KickStarter campaign. Number two: Be aware that Murphy's Law will rear its head, and something will go wrong, so plan that into your timeline. I was cautious with Tale of the Wizard's Eye KickStarter campaign and built in several extra weeks of time for delivery of backer rewards (Fulfillment by August seemed like a worse case scenario at the beginning). Things happened and certain parts of the module were significantly delayed. Instead of shipping backer rewards in early July, they ship at the end of July. (for clarification for backers of that project, I'm expecting to begin shipping those rewards this weekend once the ESS package is finalized). 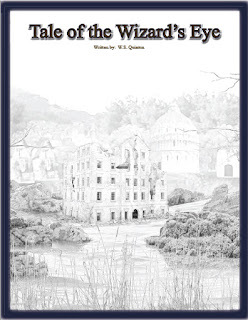 The end result is that Tale of the Wizard's Eye is on schedule for backer reward fulfillment. Also look ahead to convention schedules, and plan to have your physical copies a month ahead of the major conventions if at all possible. Print on demand is wonderful, but when everyone is trying to get extra copies to take to conventions you don't want to be waiting in line for printing. Get it done early, plan ahead and give yourself some extra time for delivery. Number three: You will get some weird offers. KickStarter says this in their material and its true. People will contact you with some strange and often suspicious offers. Take this in stride and stick to your plan. I operate on the principle "if something sounds too good to be true it probably is" and would recommend that same level of caution in all dealings with people who want in on your KickStarter. Number four: Build into your goals and backer reward levels an additional monetary amount to help cover any unexpected costs. By way of example, I had to order multiple copies of proofs for physical copies as I had some problems with the covers. This was an additional cost that affected the available money to further future efforts. Do yourself a favor and build a little extra into your goal and a bit more of a margin into your backer reward levels. Since I began this adventure I've had many people express interest. Most people have been very supportive, several have been critical of my business model, and some few have asked if I would publish their material. That last part surprised me and continues to do so, but it certainly shouldn't. For years I wanted to be published by a company. I wanted to write and then have my book appear on shelves and online for people to read and I wanted to make a little money at it. Since I've founded Sinopa Publishing LLC, I've discovered that there is a lot of work to do in running a publishing business even when you are the sole author. You can write a wonderful book and put it up for sale on print on demand and electronic format for download very easily. Really anyone with a computer can do so and as a result of this fact, there are literally millions of books available online. Many of them are never read by anyone outside the writer/artist's immediate social and familial circles. 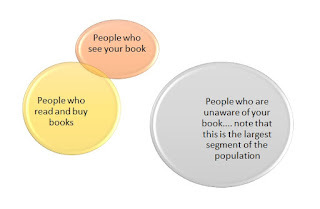 Promotion of the books is necessary to bring in new readers and begin building what is commonly referred to as "fan base", those people who have read your work before and liked it enough to read another book you've written. These are the most important people you can cultivate as a writer and publisher. As a writer, you want people to read your work. As a publisher, you want people to BUY your work. Forgive the crudeness of the Venn diagram, I was in a hurry. 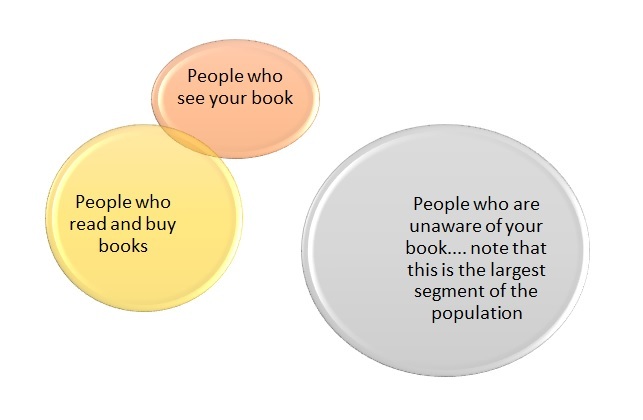 So as simple as it may seem, you need to bring those people who are unaware of your book into the the "People who see your book" pool. This is to enhance the quantity of people who exist within that intersection of people who buy it. The need to enhance product awareness in order to drive sales numbers is the reason the advertising industry exists. Ponder that. When I started Sinopa Publishing LLC there were a LOT of things I didn't know. I had to research, identify issues, address legal needs, find printers and POD services, and a whole host of other things. As a first time publisher, I didn't know everything (and still don't). But I knew that I didn't know, and thus I had attained a level of wisdom. So acknowledge that you don't know everything (I know, its hard, we all believe we 'know' or we'll figure it out) and begin your research. READ articles, read information provided by print services and pod providers, read forum posts (I really like haunting the posts over at Amazon's CreateSpace and KDP sites as there is a wealth of information to be had), and ask questions of people who have been doing this for a while. Don't know what an ISBN is? You better ask around, and research that. Need to file a copyright to protect your work, you need to research that soon (here is some help: https://www.copyright.gov/registration/ ). Making money means making sales at a profit. You have to do your math, consider print and shipping costs (where applicable), know how much you are paying and what you should be receiving. Know what your money should be doing per sale. Know how much you need to set aside for taxes, how much it costs for you to move the money to your bank, how much you are paying to your contributors, and please do this math before you release your product or launch your KickStarter. Take a page from successful businesses of the past and use whatever profit you may earn (that you can spare) to build your business (improve website, fund public appearances, pay bonuses to your contributors, etc.). Continuing with self-publishing, when does it just become publishing? I would argue that it becomes publishing once you are publishing things you haven't had a hand in creating directly. I mean to say you haven't created any of the art, you haven't done the writing, but you are releasing the book. This is probably an oversimplified definition but its the one I'll be working with. So far I have had a few people ask if I would be willing to publish their work. I have encouraged each to undertake the publishing themselves as I believed they will make more money doing it themselves and it is an enlightening process. It turns out I may have been mistaken in doing so. I have basically put those people on a more difficult road without knowing if they can complete the task. They may have written the most brilliant of books, but if they don't publish it the world will not have it. I should have thought that through. Now there are concerns, to be certain, where it comes to publishing work from other people. You don't want to publish something that has been plagiarized from another work (you don't want to steal and you definitely don't want to get sued). So checking the work against other materials is important, in my thinking anyway. Other concerns over content, resources, and time are a bit outside of what depth I want to go into on this posting, so I'll just point out that you have additional concerns when dealing with other creators. I'm going to test my hand at this by publishing a work from one of my brothers. We'll work it out and get it into the development process and I'll let you all know how that pans out. One thing I would like to encourage though is this: document the process and turn it over to the writer. Give them the knowledge to permit them to self-publish with greater ease for future products. The writer may not want to publish themselves (I think most of us can attest to the fact that publishing is a LOT of work), but give them that chance and that choice. Be there to mentor as you can. Build the community and you'll be building greatness. Please do share this post with others (artists, writers, friends, family, etc. ), I hope this blog can be a resource for many people for years to come. 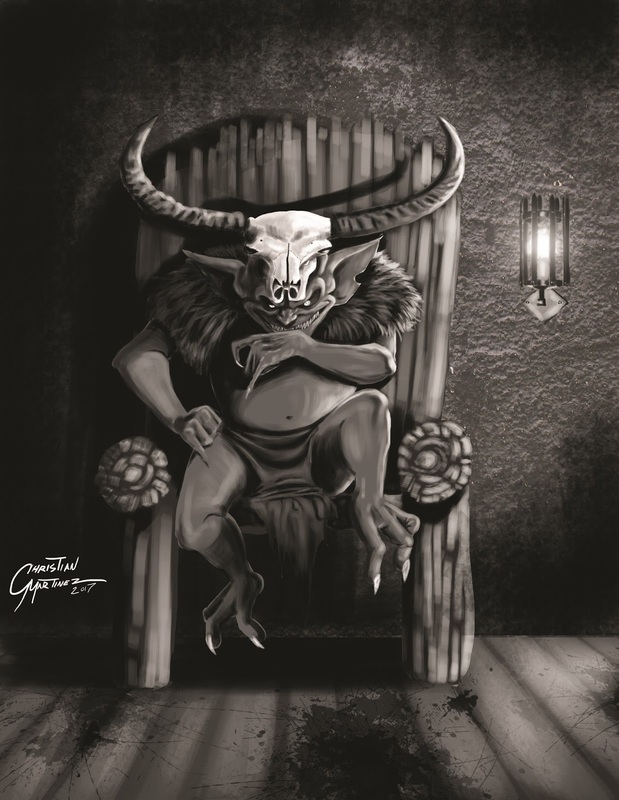 Goblins, coming adventure modules, and art by Christian Martinez and Jake Ochoa!!! 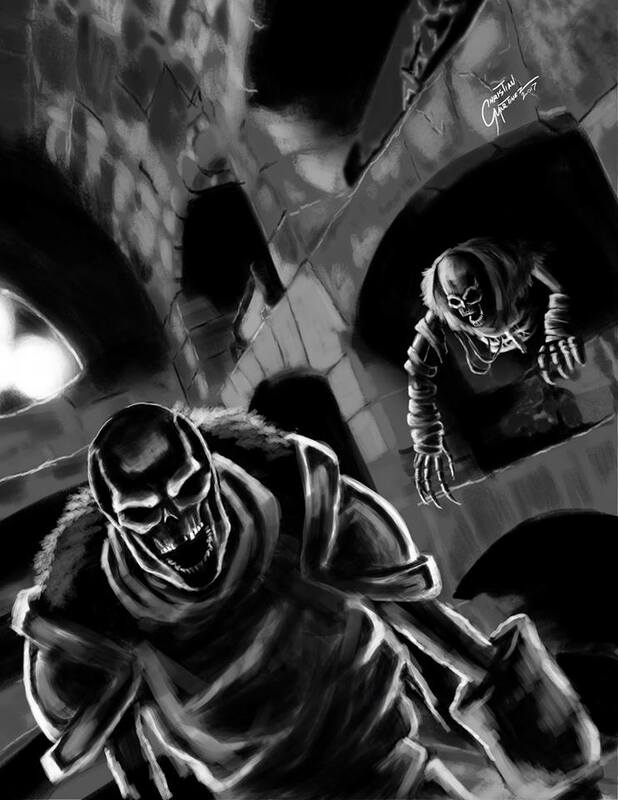 Goblins! 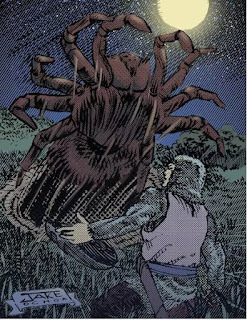 A common creature to many campaigns and settings. The evil little buggers are generally despised, and with good reason. 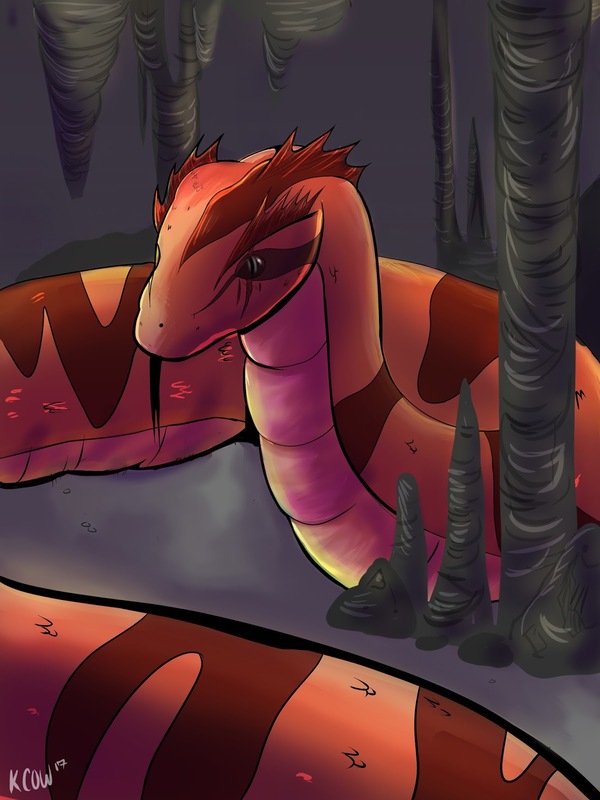 Filthy little creatures who prey upon the weak and helpless, who waylay hapless adventurers, and who generally suffer from poor hygiene. 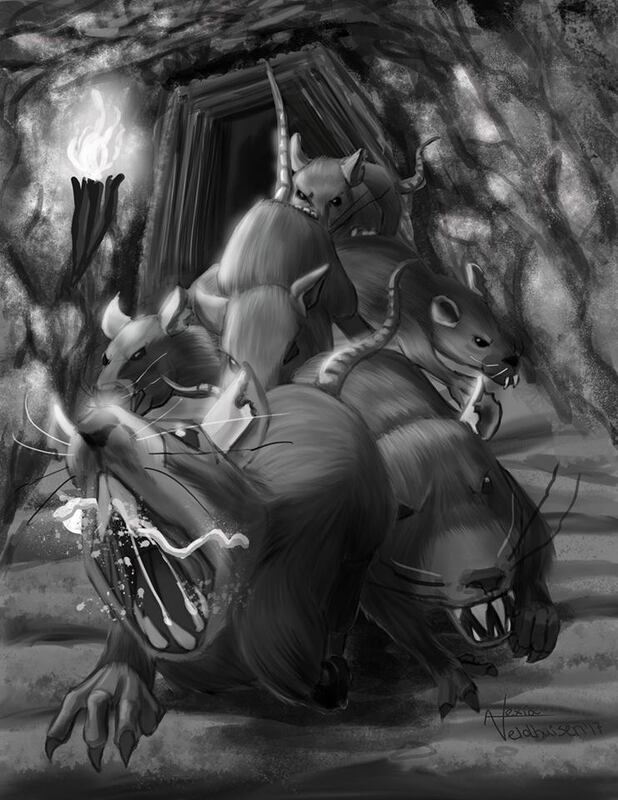 Much like halflings, they steal, stink, and carry the plague (inside joke, sorry, couldn't resist). 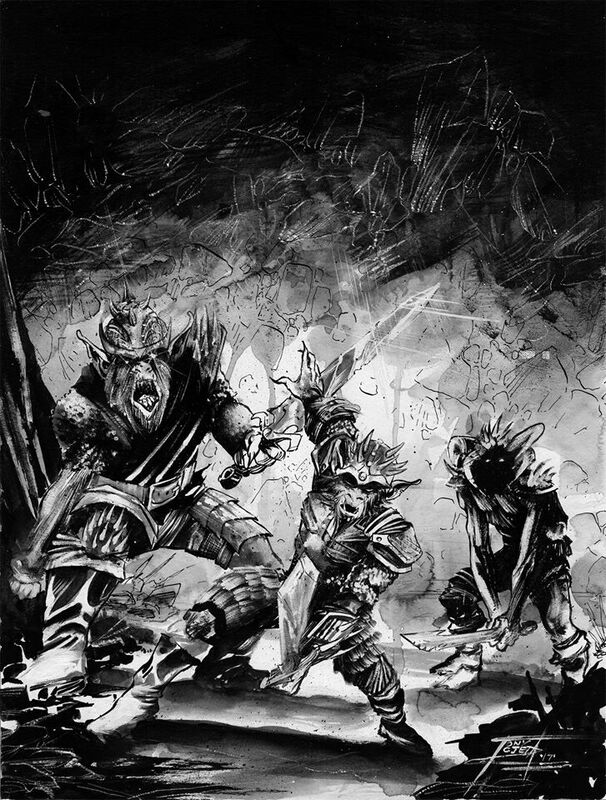 So why then do so many campaigns feature goblins for low level encounters? Different Dungeon Masters/Game Masters will give you different reasons. From my perspective, the little menaces are fun little beasties who are usually easily vanquished by your neophyte heroes. This makes them a good opponent for lower level characters to face off against. Young characters can battle evil, rescue the weak and downtrodden who are so often victims of goblinoids, and begin their heroic careers. 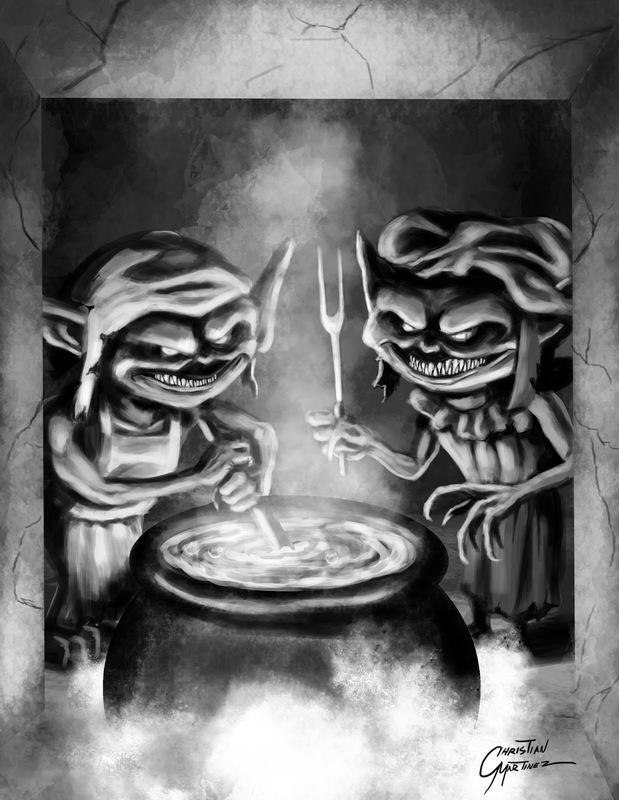 Goblins are good beasties for your player characters development, as they can give a bit of a challenge, yet you can generally expect your player characters to triumph over them. Those initials victories can be very telling for how your campaign may evolve. Sometimes you need goblins to present more of a challenge. At lower levels this is usually accomplished by simply increasing the number of goblins present in the encounter. This is handy, easily managed, and gets a little tiring after a while. Then you have the opportunity to construct more challenging goblin menaces. Tolgathi, featured above, is a principle character from The Draw of Glenfallow and a good example of this principle. Without giving too much away, it is safe to say that Tolgathi is a goblin who will leave an impression those groups who confront him. 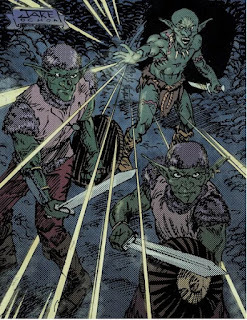 These character type goblins, have more on the ball, should have some lines of dialogue to further set them apart from the run of the mill goblinoid, and should demonstrate some abilities on par with the characters it is confronting. Goblinoids don't have to be tough, smart, or individually menacing. They can be weaker, a bit less competent, and they can suffer defeat without ending the campaign. 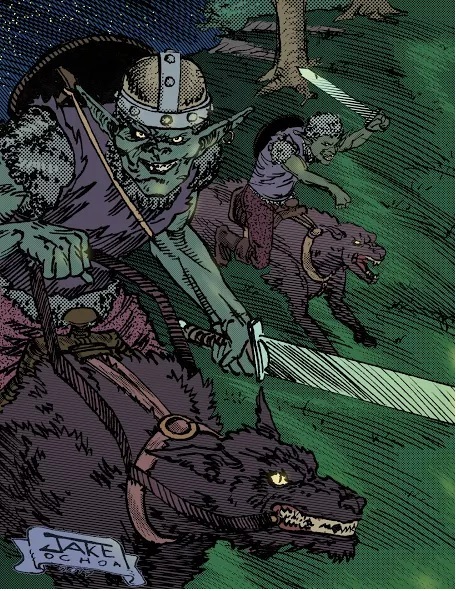 Keep in mind though, that just because goblins are usually easily dispatched, they can still do significant damage. 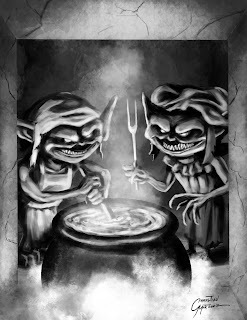 While a party may walk over the corpses of dozens of goblins in the course of an adventure, the damage done by those goblins can add up to become a serious threat to the party. I recommend using goblins to wear down the party and to force the use of resources. 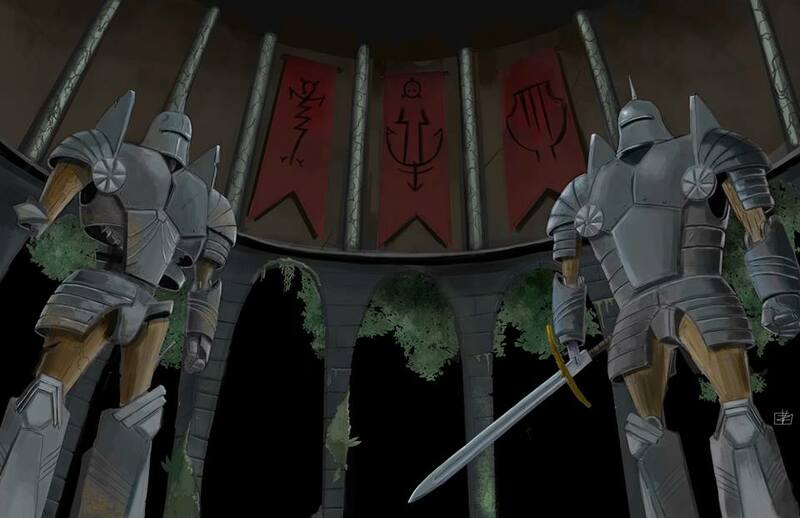 Let the triumphant heroes have their victories, and make them pay for it with scars from goblin arrows, the costs of potions, healing spells, and replenishing ammunition. Goblin tactics are usually lacking in sophistication. The usual application of "the pointy end goes in the elf", is the most commonly witnessed tactic employed by goblin raiding parties. Having a goblin war leader or chieftain, some goblin who commands other goblins with a degree of finesse, to lead goblins and apply a more intelligent battle plan will turn goblins into a more menacing threat. 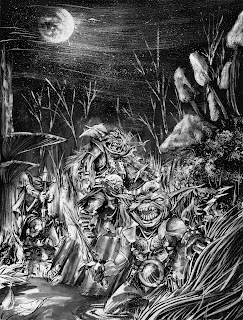 Goblin worg riders who ride by and harass their victims while dozens of goblins on foot move in to surround the victims... basic tactics can make even the lowly goblin more of a challenge. Do you like challenging, gritty campaigns? Then apply tactical thinking, where applicable, for even the lowliest of challenges. 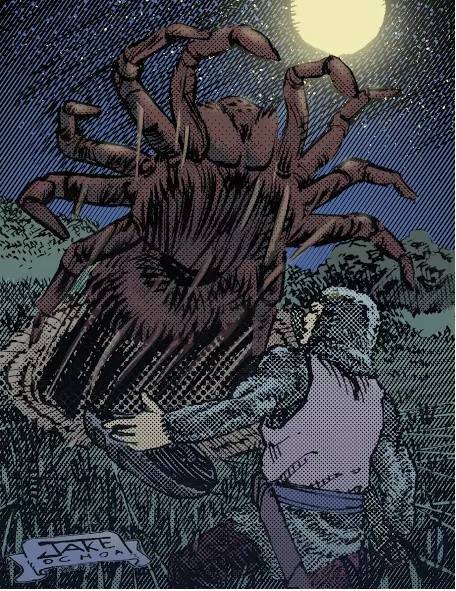 Look for goblinoids in fortified positions, using strong tactics, and posing a genuine threat to the peace of the surrounding areas in the Tarot Adventures coming soon from Sinopa Publishing LLC. As always I hope you will join me next time. 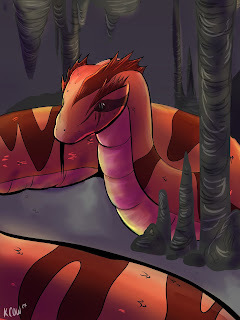 Some things I've done to publicize my coming works, and art by: Several talented Artists! You can learn more about Zachary Viola and his art HERE. Today I would like to share with you some of the things I've been doing to help raise awareness for the books I am writing and releasing. Please do remember that I am new to the self-publishing business, and the things I'm mentioning are my particular actions. Please do research your own genre and decide what, if any, of these actions may benefit you. First thing I've done for promoting my books is to start a blog. 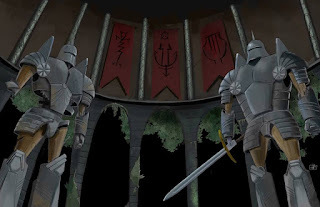 I had never blogged before, didn't really now much about it (still figuring some things out), but knew there was an audience for role-playing game themed blog, simply by the number of them I found when I started my research. To start the blog, I first had to do some research. This involved a LOT of google searching, reading different blogs, ignoring people who wanted to charge me money to "teach" me how to be successful at blogging. To be fair, my view numbers aren't huge. My most viewed blog entry has a little over 400 views to it. Honestly, that is far more than I expected so soon after starting, and presently (as of this writing) this blog isn't six months old yet. 1) Research blogging, even if you have a successful and popular blog. Take a moment and learn what other people are doing to draw an audience. 2) Post frequently and attempt to engage your audience's interests. 4) Find a synergistic site or sites to share links with. Be careful with this, and find sites that have related material to direct people to. By way of example, I also write children's books and I have set up links to the site of a friend of mine who manufactures high end "derby racers" which are high end rocking horses.We have shared links between his site and my children books blog. Traffic moves between the two. 5) Look over your statistical data. Check to see what type of headings/titles are receiving the most attention. This is like using the calibrated eyeball technique as a variety of SOE. Building topics that people are interested in, to keep viewer/readers and writing to your knowledge of that subject. 6) Know when to admit you aren't an expert. No one likes a know-it-all, but more people actively dislike people who give them information while purporting to be an "expert" and then discover that the information was incorrect. Know when to clarify what is speculation and what is hard fact. 1) Engage podcasters: I've secured interviews with a small number (3 to date) podcasters to appear on their broadcasts. This has had an immediate effect for me as it expanded the visibility of my first book to new crowds. So look at podcasters, even those with only a few dedicated listeners/viewers as a resource. You can help them by providing material (information about your products) while you are helping to promote your material. Remember that you are each doing the other a favor. Be professional, honest, and timely. Find out when your podcast interview will be published online and listen to/view it. Share the link to that interview around (you'll be helping to raise awareness for the podcaster), use Facebook, Twitter, etc. to let your crowd of people experience what you are doing in new ways. 2) Be open to public appearances: I will have my very first book signing on July 29th, 2017. I'm terrifically excited by this. This was also a great opportunity for mutually beneficial promotion. I was able to sell a small number of copies of my book to a nearby games/hobby store and set up the signing (free to all who come down) and they were kind enough to promote my book's KickStarter campaign on their Facebook page. Total win/win scenario, with no real cash spent (the books the store is buying are discounted (basically just print costs and artists royalties), I'm out of pocket on shipping and my gas money to drive 30 miles (its in the nearest large city to me). All in all I'm out about $12. I can safely reveal that I secured about $300 in KickStarter backing from this promotion. 3) Social Media: If this isn't a given, then you should rethink things a bit. For a total of seven shares of a link to my KickStarter campaign for Tale of the Wizard's Eye, I had a total of 483 people see that link, and about 30 people who went to the KickStarter (tracking hits from Facebook is a nice feature). Those 30 people who came from that particular link, resulted in 22 of them backing the project for almost $250. This is from one share (the last one before the campaign ended) and it was fantastically great for me. Those numbers might not seem large, but as this is my first book to be self-published my position is that every dollar counts, every reader is cherished, and every KickStarter backer is a treasure. 4) Think ahead: Tale of the Wizard's Eye has an small "Coming Soon" bit in the back of the book with information taken from the KickStarter campaign I am preparing for the next book: "Tarot Adventures, Book One: The Draw of Glenfallow". 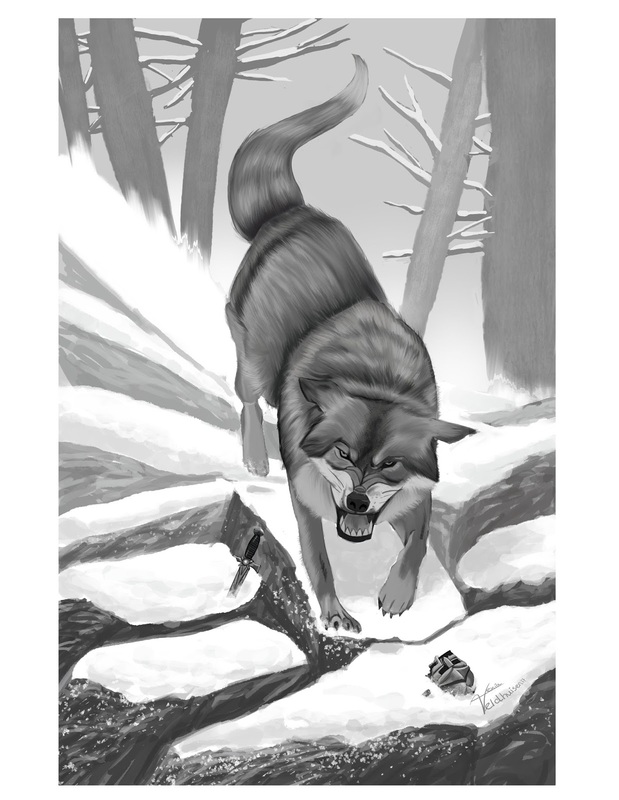 It includes a great image done for that book (Again, remember to include in your agreements with your artists to all for use of the art to promote the book. This is not legal advice and is not meant to be construed as such. This is a best practice I have chosen to adopt. For legal advice seek advice from a practicing attorney). This places a simple sample of the work, in this case a synopsis, as well as quality art right in the hands of a prospective reader/customer. The last thing I've done, that I'll post about here today, is that I've asked for help. Yes, you read that correctly. I asked for help. I ask my readers here on the blog, I ask my social media friends, I ask people in different social media groups on Facebook and the like, as well as the artists involved in particular projects to help spread the word about the books being released. Ask, and ask nicely. Be polite and of good tone. Nobody owes you anything, so don't pretend or delude yourself into thinking they have to do something for you (because they don't), but if you ask nicely and don't make a burden of things you will find that very often people are happy to help with a retweet, or a like and share, or whatnot. What I've seen is that this generates interest outside your immediate circle (great!) and tends to grow outward (what I'm told is referred to as organic growth, but don't hold me to that as a technical term... its just what I've been told). As more people see your work and spread the word around you will see an increase (at least I have) in the number of people who visit your sites and look for your work. Be nice, be genuine and truthful, and people will take interest.